Christine's love of the Boxer started when she was two years old. Her grandfather, Meritt Zwicker, bought a Boxer by the name of Sandy in 1963. No one wanted the dog as he was totally uncontrollable. Her grandfather had him trained in no time and Sandy was Christine's first true love. Christine's next experience with Boxers was not until 20 years later when her husband Wilf bought her a registered male. The dog was a mature male already set in his ways and although beautiful did not like other men or dogs. Which came to be his demise when he had to be put down after killing another dog. The first being 'Tess' Tricker's Flair For Fashion who was a plain, natural eared girl of outstanding quality. Tricker's Flair For Fashion "Tess"
Not exactly what we were hoping for, all plain girls, regardless we kept this little cutie back to continue the line. The second was 'Bubbles' Trickers Bubblin' In Black who did not finish her championship but she did acquired 6 points. Bubbles also won a few Reserve wins at some big specialties. ​These two girls are Grandmother and Great Grandmothers of our Boxers. Tricker's Bubblin' N Black ​"Bubbles"
Was a beloved family dog for us who we still miss terribly. ​This pretty boy went back to the Fishers and sired many lovely litters for them. If Hope was the foundation female for Tricker Boxers then 'Max' Can.Ch.Berlane's Corporate Image SOMC would be our foundation male. Max was purchased from Sharon and Ron Berry of Berlane Boxers. He was a stunning dog with an equal stunning pedigree. He was son of Am.Ch.Rochil's Grande Marshall LOM, a Top Winning show dog in the USA, and Grandson of Am.Ch.Marquam Hill's Traper of Turo LOM, a Top producing dog in the USA. Max had a hard experience he had while young at a dog show and did not like showing. Sharon owned him for 6 years and decided to place him. Max came home with Christine, Wilfred and Crystal on April 5th, 1999 and during this time Max was taught to love the show ring again. The work paid off when Crystal showed him to many Best Veteran In Sweepstakes and Best Veteran In Specialty wins. He even went on to win an Award of Merit from the Veteran's class in 2001 at a large Specialty. Max completed his requirements for his Sire of Merit in 2000. Max passed away 5 years to the day after coming home with the Trickers on April 5th, 2004. He is Sire and Grandsire of the Boxers we have today. To date Tricker Boxers Registered has 31 Canadian Champions, 1 American Champion, 2 Sires of Merit, 3 Dams of Merit, and 5 Producers of Merit. 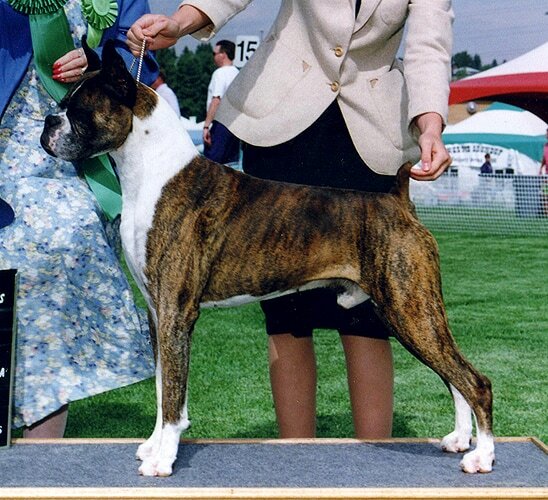 The blood lines behind Tricker Boxers are of Salgray, Tradonalee, Starview, and Berlane/Rayshar Boxers. Recently there has been the addition of Rummer Run, Woods End, and Telstar thourgh the incorporation of Razor. The Tricker home is located in Central Alberta, Canada just outside the small village of Caroline. They own a large farm located on a dead-end road. 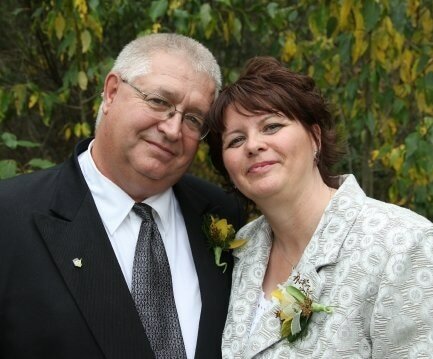 Wilf and Christine Tricker have been married 38 years and have 5 children. Aaron being the oldest, then Jacob, Caleb, Crystal, and Matthew. The boys are always willing to lend a hand with the dogs. Crystal however took more of an interest and shows, trains, grooms, photographs, and maintains this website for Tricker Boxers full time. From Wilfred & Christine: A very special thank you goes to all those that have helped us to be where we are today. We have made many friends over the years through our best friend, the Boxer.